Chinese Social Networking Site Renren Rises 29% In NYSE Debut; Now Facebook? Renren's successful IPO could be the curtain raiser for what is to come if the world's No. 1 social networking site, Facebook, goes public next year. Shares of Renren Inc, one of the biggest social networking companies in China, surged 28.6 percent in their debut on Wednesday. Strong demand for the unprofitable company -- which will make money "very soon," according to Chief Executive Joseph Chen -- is the latest sign investors are eager to snap up stock in social media companies. The stock rose as high as $21.93, or almost 56.6 percent above its $14 IPO price, in its first day of trading on the New York Stock Exchange before closing at $18.01. Earlier on Wednesday, Renren raised $743.4 million in its IPO. Renren's offering comes amid a grab for hot social media companies, including Twitter, Facebook, Groupon and Zynga, which are propped up by multibillion-dollar valuations of their shares trading on the secondary markets. "There is no doubt this just adds to the allure to a potential Facebook IPO," said Morningstar IPO strategist Bill Buhr. Facebook has a market value of around $70 billion, based on a share sale currently being contemplated, making it worth more than companies such as Boeing Co.
Renren shares are trading at slightly more than 80 times annualized sales for the six months ended December 31, 2010, estimates IPOdesktop.com President Francis Gaskins. That's well above Facebook, valued at 35 times last year's sales in gray market trading. "If you like Renren, you'll love Facebook, Gaskins said. High valuations for other social networking companies, combined with the fact China is the world's biggest Internet market, were expected to help Renren attract investors. On Tuesday night, in anticipation of Renren's IPO, Chinese Internet stocks, including search engine Baidu Inc and online media company SINA Corp, traded off in heavy volume. Investors in Renren seemed to brush aside recent concerns dogging the company, including questions about its internal financial controls, the resignation of its audit committee chairman and the tight control and censorship of the Chinese government. If Renren fails to comply with Chinese government Internet regulations, its websites could be shut down, according to the risk factors section of its prospectus. Renren -- whose name means "everyone" in Chinese -- has also faced questions about the number of users it has. The company, in an amended IPO filing on April 27, had to revise the number it said it had in December 2010. According to the revised filing, Renren's monthly unique log-in user base grew by only 5 million, or 19 percent, in the first quarter of 2011 -- not the 7 million, or 29 percent, it previously reported. A spokesperson for the company said the revision corrected a typographical error. Either way, companies in China's red hot tech sector have a history of providing opaque data and statistics. Some brush off concerns, saying the direction of the numbers is more important than specific figures, but others have expressed concern. A handful of research firms -- some associated with short sellers -- have begun issuing reports criticizing the financial reporting of some Chinese companies. One such report led to the resignation of Renren's audit committee chairman and director, Derek Palaschuk. He told Reuters in an interview he resigned to protect Renren from any possible fallout from accusations of accounting fraud at another company where he is an executive. Palaschuk's resignation was for personal reasons, Renren CEO Chen told Reuters Insider. "I'm not personally concerned about it. I'm pleased that the board paid attention to the issues it should be paying attention to and took proper action," said Dixon Doll, co-founder and general partner of venture capital firm DCM, which is an investor in Renren. Renren's IPO gave it a market value of $5.7 billion, according to an underwriter. It closed out its first day of trading with a market value of $7.4 billion. "(Renren) is basically Facebook with a few fleas," said Morningstar's Buhr. 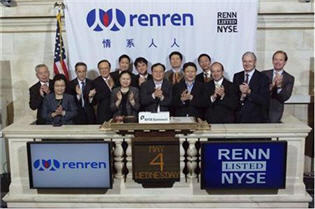 Renren had net revenue of $76.5 million in 2010 and about 117 million activated users as of March 31, 2011. It had about 31 million monthly unique log-in users in March 2011. Beijing-based Renren sold 53.1 million American Depositary Shares for $14 each on Wednesday. It had planned to go public for $12 to $14 per share after raising its estimated price range by 30 percent last week from $9 to $11. The IPO was originally expected on Tuesday after the close of U.S. markets, but was delayed until Wednesday morning. Clearance by the Securities and Exchange Commission took longer than expected, Chen said. Morgan Stanley, Deutsche Bank and Credit Suisse led underwriters on the IPO.